I’m a doofus when it comes to choosing the right hair color for my graying locks. And, the idea of putting toxic sludge on my head to cover it up is always scary. Still, I’m not ready to go silver so I dutifully have it colored every 2-3 months. I wish I was better at doing it myself, but I’m like a banshee in a paint store. If there’s any way to get it all over myself and destroy the bathroom, I’ll find it. A while back, I won a root touch up kit that came from a company called Madison Reed. The kit comes in a compact with a wide brush. You can use it to cover up the skunk-like sideburns that pop out when your color job starts to fade. This is me without makeup and with my gray starting to show on the sides – Scary, right? All you do is brush it on, and VOILA, your hair will look like you just came back from the hairdresser. My favorite way to use the root touch up kit is to fill in my almost non-existent eyebrows. Over the years, the ends have faded and disappeared. They’ve never been symmetrical, either. One of them curves upward while the other is more straight across. I love how this product makes them look soft and natural rather than painted on. It’s become a must-have in my makeup case and I never travel anywhere without it. I’ve also been using Madison Reed’s Color Protecting Shampoo and Conditioner. I have fine hair that has a tendency to get dry. After I wash it, my hair feels soft and luminous. The shampoo/conditioner duo locks in the color and has UV protection, which is important if you spend time in the sun. I’m definitely going order more. An annoying thing that happens is that my color job starts to turn red after a while. I like it as dark as possible without being completely black. Madison Reed has a color reviving gloss that enhances the color so it doesn’t fade out. Looking for healthier hair color? Here’s the best part. Madison Reed’s products have been formulated to be non-toxic. They don’t contain harsh ingredients like most standard hair color products. 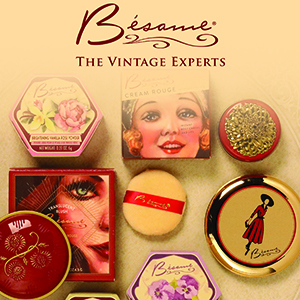 You’ll never find ammonia, resorcinol, or parabens and they are PPD-free. You also won’t be knocked over by strong fumes, feel itchy or get burned. 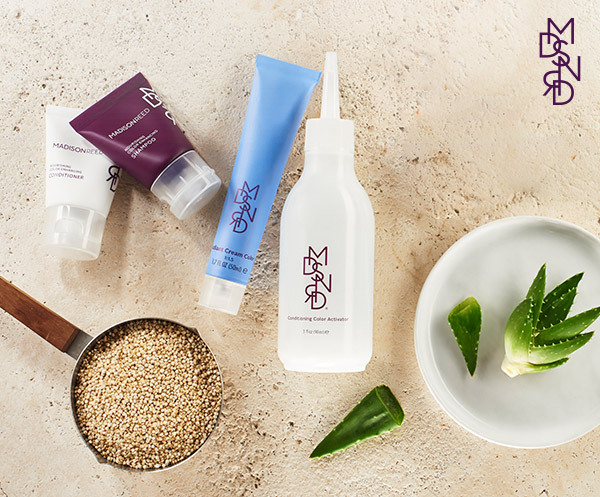 Madison Reed products contain Argan Oil, Keratin, and Ginseng Root that protect and fortify your hair. Visit the Madison Reed website – click on SHOP – and then PERMANENT COLOR. You’ll then be asked to take a quiz to determine your hair color needs. How much gray do you have? Is your hair color resistant to gray? Has it been previously treated? How often does it need to be colored? What is your current color? Do you want to go lighter, darker or stay the same? After you click submit, you’ll be directed to a page that will suggest the best color options. Mine was Positano Black. Anything having to do with Positano sounds fabulous to me. This video shows you how to cover up stubborn grays. Another way to cover up your gray roots is to use Madison Reed’s Root Reboot. The color Activator has a sponge tip applicator to help you avoid spills. (As I mentioned, I’m a klutz!) Just dab it on your roots and in 10 minutes you’re done. There are 6 universal color choices to choose from and each kit comes with liquid color, color activator, 2 pairs of gloves, a cleansing wipe, samples of shampoo and conditioner and instructions. 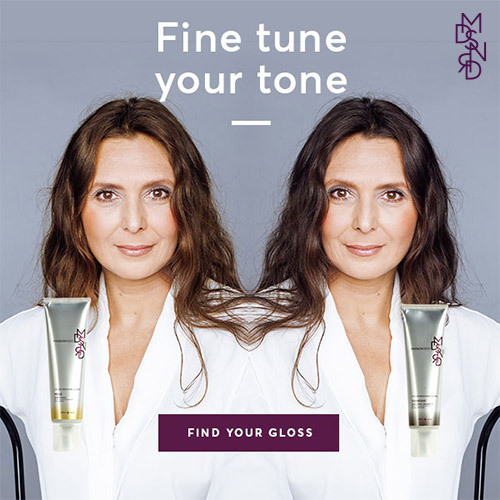 Please click here to find out more about Madison Reed products. Do you color your own hair? Are non-toxic ingredients important to you? Please leave a comment below. Well, don’t you look beautiful! 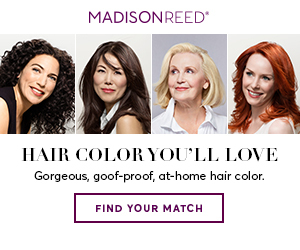 I LOVE MadisonReed products!!! You look great. I love that it includes the eyebrow brush, that’s a great invention. Thanks Rena – I love the eyebrow brush. It’s the best! You look great either way but, wow, that touch up kit is amazing! I would be terrified to do my own color and have been using my beloved Laura for years. I can’t imagine my hair without her! I’m the same way. Doing it myself doesn’t work for me, but touch ups are easy with the kit. However, for someone who can do their own hair, it saves money and that fact that it’s a healthy product is phenomenal. I remember my mom trying to color her hair one and it was a disaster – and smelled. So I’ve never tried it myself and I’m sure I never will. A few weeks ago I added blondish highlights to the color I’ve been having dyed for years. I think it brightens my face a bit. You look great with your kit and color! Yay YOU! Thanks so much Cathy. I bet your highlights look amazing! I really need a touchup kit to help out between colorings. Those gray hairs seem to sprout just days after I’ve had my hair colored. It really seems like it, doesn’t it? They just pop out when you least expect it. My streaks often look orange in photos, and with my fizzy hair, kinda like Bozo. I need to find a new colorist or stop coloring my hair at all, a BIG decision. I know what you mean. My hair has a tendency to get red. Usually, a little ash keeps that from happening. The decision not to color is life changing. For me, I’m going to keep doing it but I know women with gorgeous gray hair. My colorist does my hair because I like to have low lights, highlights and, well, I like to have HELP! My big question is always “what colors go best with..” whatever my new color is. This summer I’m red–strawberry blondish. All makeup and fashion colors seriously changed! That’s true. A change in hair color changes your entire palette. My mother used to be a color consultant so I’ve always stuck to my “winter” colors. And I hear you about the help. I need lots of it. What a great idea – dark hair and gray are always at odds with each other and this looks like a great way to keep the visits to the hairdresser to a manageable time frame. Looks like you’re on a winner! Yes, my insistence on keeping my hair dark makes the gray show up almost immediately. But it’s nice to be able to cover it up when I need to and no one can tell the difference. I love the root-touch-up. Rebecca – I still have my kit and forgot all about it. Didn’t know it had an eyebrow brush. Will be getting that sucker out tomorrow. Your hair looks lovely! Thanks, Cathy, yes get your kit out. You will love it. Saves you a few trips to the hairdresser, that’s for sure. And the gloss is terrific too. It revives your color when it starts to fade and makes your hair feel soft and beautiful.